It's said that a centaur's road is paved with the corpses of the fallen. For the one called Warrunner, it has been a long road indeed. To outsiders, the four-legged clans of Druud are often mistaken for simple, brutish creatures. Their language has no written form; their culture lacks pictographic traditions, structured music, formalized religion. For centaurs, combat is the perfect articulation of thought, the highest expression of self. If killing is an art among centaurs, then Bradwarden the Warrunner is their greatest artist. He rose to dominance on the proving grounds of Omexe, an ancient arena where centaur clans have for millennia gathered to perform their gladiatorial rites. 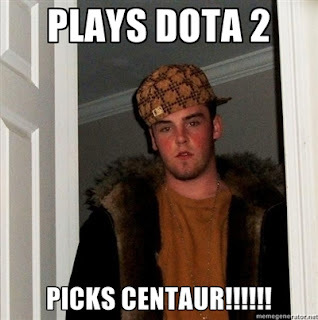 As his fame spread, spectators came from far and wide to see the great centaur in action. Always the first to step into the arena, and the last to leave, he composes a masterpiece in each guttering spray, each thrust of blood-slickened blade-length. It is the poetry of blood on steel, flung in complex patterns across the pale sands of the killing floor. 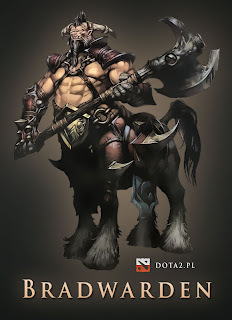 Centaur is a hero that have high STR and HP to tank all enemy's damage. Be the first who comes to every teamfights! You are a teamfights initiator. You have the AoE stun that makes you can start a teamfight. We recommend you to buy tanker items like tarrasque or Blademail. Your part is to be the first to start a teamfight, you need to stun your enemy so that your friends can deal the damages to kill all the enemies. Your main ability as a teamfight initiator. You will get every enemy around you to be stunned so your teams can attack them. You need to place yourself beside your opponent, so you may need initiator item like Dagger, Shadow Blade, or you can use your ultimate skill Stampede. Centaur strikes a mighty blow at melee range, damaging both himself and a small area around the target. Centaur cannot die from Double Edge. Your ability that have high damage to a target. This ability will also hurts you. But, because you almost 100% will have more HP that your opponent, it will be no problem. Very good to lasthit enemy heroes. Very good ability to defend yourself against carries who will hurts you with their physical attacks. It will deal more damage in the late game because of your high STR. Carry that right clicks you in late game, can die because of this skill. Your attacker will not feel it, but suddenly they will be in a low condition or if you're lucky he will death. Centaur leads all allies into a vicious charge causing them to move through units at max speed and stun enemy units they tread upon. Each enemy can be trampled once and takes damage based on the Warrunner's strength. Makes yourself and all of your teammates to move so fast in 3.75 second and can move through untits, and stunning and damaging the enemies. Very good ability to initiate a teamfight. With the bonus movement speed, your team can catch opponents easily and then stun them and makes teamfight to your teams favor.You also can use this ability on surprise gank from the jungle, and stun all the enemies you move through. After using this ability, you better use Hoofstomp to make the stun duration become longer, and the enemies can't do anything. Why Hoof Stomp should be maxed first? This is your main ability, you need to stun your enemy to start the teamfight. You also can use this skill for defensive purpuse so that you can save lifes. Why Double Edge before Return? You need nukes in early games. Nukes will rech its maximum potential in early game where enemy's HP is still low. And return will rech its maximum potential in late game when your strength is already high, so no need to take Return in early game. One level of Return is enough for early game. If your partner in line is not a carry, or if he is stupid, then you need to try to lasthit the creeps. You need gold too. If you feel need to kill the enemy, then, go to them and use Hoofstomp to them and then Double Edge and right click while your partner also use his skills. Beware of enemy's gank attempt. You must see the fog area by using Wards. Retreat to your tower if you see the enemy that coming to you. Mid game is the time for ganking and finding weak opponent to kill. You need to see the minimap and find the alone opponent. So you can surprise gank him from the jungle. Ask your friend to gank together with you. In the gank, you need to focus fire on one target. So communicate it with your friend. Choose the easiest target to start with. You may also needs dust to reveal some invisible hero like rikimaru or Nyx. 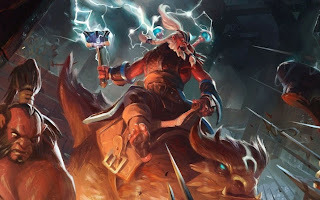 After you come out of the jungle, immediately use Stampede and go Hoofstomp to stun the enemy, and then double edge and right click, your friends should also use his skills after the enemys is stunned. You should dominate the mid game that will means easier late game and more chance to win the teamfight. Your part is still the same, taht is to initiate the teamfight. 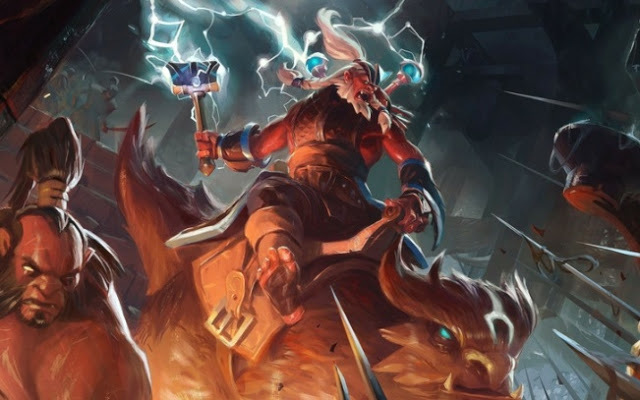 You need to Stampede so that you and your teammate get attack speed to bump into the enemies so the enemies can be stunned before the teamfight. And then you should Hoofstomp to stun the enemies for longer time. And then use double edge after it, and if you have Blade mail use that too. Here in late game, I believe that your STR is already very high so you can tank damages and return some damages to hurts the enemy itself. Why Power Threads? You can use Power Threads STR to makes you more tanky and deal more damage with Return. This boots also adds some attack speed to help you right click the enemy. Power threads is also a flexible shoes, you can change it to STR, AGI, or INT for what you need. INT Power Threads will be needed if you have insufficient mana for 1 ability and you just need about 20-30 more mana. Why Vanguard. Will reduce physical attacks damage. So good for a tanker like Centaur. Really helps in a teamfight against some physical attacks. Why Heart of Tarrasque? Bonus STR and HP makes you a super tank. Makes you can braved all obstacles that hurdles in your way. And the STR also gives you more Return damage for countering the physical attacks. In a very late game, you can sell Vanguard and change it into more Tarrasque. After you initiate a temfight and all the enemies are stunned. He will then blinked in and use Blackhole to catch all of the enemies. A very nice combo in initiating a teamfight. Naix will deal more damage the more its enemy HP has. You have a very big HP so it will makes his damage become more painful on attacking you. Your mega ultra high Hp will mean nothing to this combo.